The youngest captain in the history of Test cricket is born. Tatenda Taibu's rise in international cricket was prodigious. He was picked up from Churchill Boys High School, sent off to tour the West Indies in 1999-2000, and quickly became a stand-by for Andy Flower, and later his replacement. 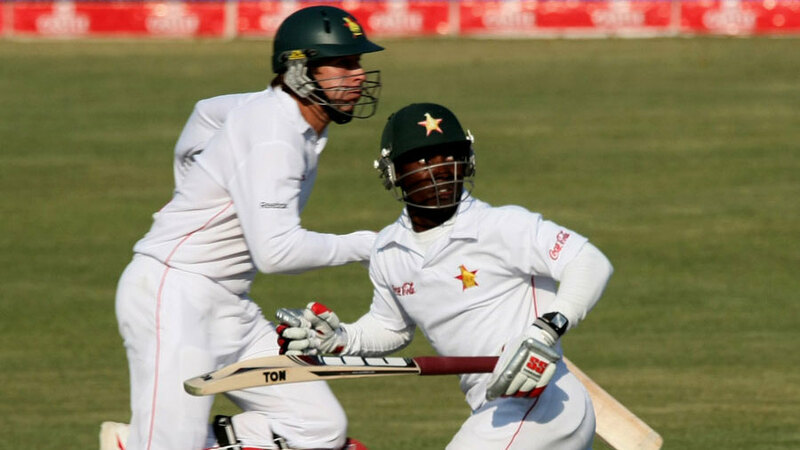 An excellent wicketkeeper and a doughty batsman, Taibu was pitchforked into the captaincy in April 2004 as Zimbabwe cricket tumbled into chaos, but within 18 months he had been forced into retirement by threats and intimidation. After spells in Bangladesh and England, he reappeared in Zimbabwe colours in mid-2007. He announced his retirement from international cricket in July 2012 at the age of 29 to focus working for the church. Four years later, he returned to the game in an administrative capacity. Not many players get to bow out with a historic and thrilling series win like Younis Khan and Misbah-ul-Haq did in Roseau. Seven balls were left in the series (and their careers) and all that West Indies' No. 11, Shannon Gabriel, had to do was see out one ball and let Roston Chase, who was on 101, face the final over and save the Test. Instead, he swung wildly at a full delivery outside off from Yasir Shah and inside-edged the ball onto his stumps to spark celebrations for Pakistan's first ever series win in the Caribbean. Younis and Misbah contributed to the 2-1 victory with half-centuries in the first match, in Bridgetown, which Pakistan won by seven wickets. The birth of ball-by-ball radio commentary in the unlikely setting of Leyton, where Essex took on the touring New Zealanders. The Rev. Frank Gillingham was the commentator on the BBC's Light Programme and his four stints only totalled 25 minutes. Reaction was lukewarm but the idea was there to stay. It would be 30 years before non-stop ball-by-ball broadcasts were launched by the BBC, with the birth of Test Match Special. In Kanpur, India, one of cricket's most innovative coaches and tragic figures is born. Bob Woolmer's use of computers and his willingness to embrace the unorthodox brought outstanding success: not least a treble for Warwickshire in 1994, a South African side who were close to unstoppable against anyone not wearing a baggier green, and a Pakistan team who learnt the virtues of discipline. Woolmer was a fine batsman too, good enough to play 19 Tests for England. However, his efforts on the field and as a coach will forever be overshadowed by his untimely death at the age of 58 at the 2007 World Cup in Jamaica. Peter Kirsten, who was born today, was almost 37 by the time he made his Test debut, because of South Africa's omission from the Test arena in the 1970s and 80s. His talents were fading by the time he played Test cricket, but he battled doggedly, not least in Adelaide in 1993-94. South Africa had to draw to take the series against Australia, but Kirsten's 79 (in 310 minutes) and 42 (in 259) were agonisingly in vain. He made his only Test hundred at Headingley in 1994, in his penultimate Test. Nasim-ul-Ghani, born today, was the youngest Test cricketer at the time when he made his debut against West Indies, at 16. Primarily a left-arm spinner whose main weapon was flight, he could also bowl medium pace, and he was a versatile batsman too: he opened the batting for Pakistan and also came in at No. 11. At Lord's in 1962 he struck a century - the first by a Pakistani in England - having come in as a nightwatchman . He was assistant manager on Pakistan's 1996 tour of England and has since had a spell as a national selector, an ICC development officer in South Asia, and a match referee. Birth of Carlisle Best, the Barbadian who began his Test career in true calypso style - his first scoring shot was a hooked six, third ball, off Ian Botham. That was in Jamaica in 1985-86, but Best's best came four years later, also against England. On his home ground he laced a tremendous 164 in a series-levelling victory. That was his zenith: his next four innings, in Pakistan in 1990-91, brought scores of 1, 8, 6 and 4. Best was not picked again. Arthur McIntyre, who was born today, played only three Tests for England, but that owed more to the brilliance of Godfrey Evans than any of McIntyre's own failings. He started life as a legspinner, and first kept wicket in an emergency, but became a key member of the all-conquering Surrey side of the 1950s, and was a Wisden Cricketer of the Year in 1958. He was later Surrey's coach. Birth of the Gloucestershire and England allrounder John Mortimore, who never really cracked it in nine appearances at Test level. He averaged 24 with the bat and 58 with the ball, but was more effective in county cricket, where he and fellow offspinner David Allen formed an outstanding partnership. Mortimore took four wickets in five balls against Lancashire at Cheltenham in 1962, and captained Gloucester between 1965 and 1967. He was also bowling when Lancashire's David Hughes launched his famous twilight assault - 24 off an over - in the Gillette Cup semi-final of 1971 at Old Trafford. A prodigy is born. Ken Viljoen made his debut for Griqualand West at 16, and was thrown into the South African Test team at 20, against England in Johannesburg in 1930-31. South Africa won that game, but it was one of only two victories in 27 appearances for Viljoen. He was a serene, classy batsman whose first Test hundred, against Australia in Melbourne in 1931-32, came at the beginning of a run of scores of 0, 111, 2, 0, 1, 1 and 0. He died in Krugersdorp, Transvaal in 1974.